Spanish Cross backrest insert in Marine Grade polished aluminum. This type of aluminum polishes to a long lasting mirror finish and holds up very well to the elements. 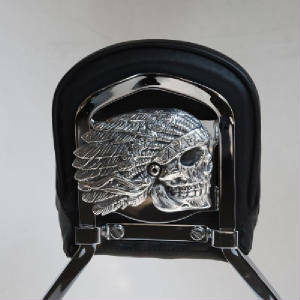 Fits all Harley backrests with threaded hole in the plate.Backrest not included. 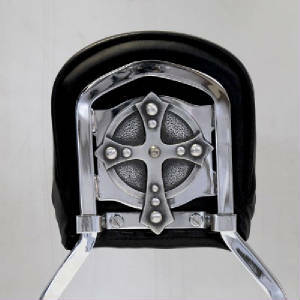 Spanish Cross backrest insert in aged aluminum. To give the Spanish Cross an aged look the artist uses a two step process. Fits all Harley backrests with threaded hole in the plate. Backrest not included. 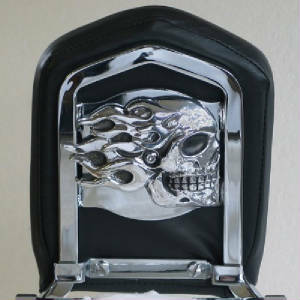 Flaming Skull backrest insert in Marine Grade polished aluminum. This type of aluminum polishes to a long lasting mirror finish and holds up very well to the elements.Fits all Harley Davidson® backrests with threaded hole in the plate. Backrest not included. 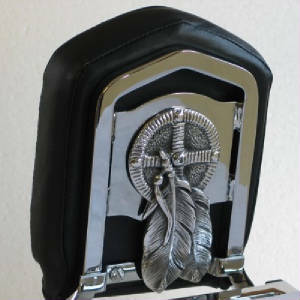 Native Spirit backrest insert in Marine Grade polished aluminum. This type of aluminum polishes to a long lasting mirror finish and holds up very well to the elements. Fits all Harley backrests with threaded hole in the plate. Backrest not included. Medicine Wheel backrest insert in Marine Grade polished aluminum. This type of aluminum polishes to a long lasting mirror finish and holds up very well to the elements. Fits all Harley Davidson® backrests with threaded hole in the plate. Backrest not included.